Dunbar and Boardman: Where is the world's highest Outdoor Elevator? Where is the world's highest Outdoor Elevator? 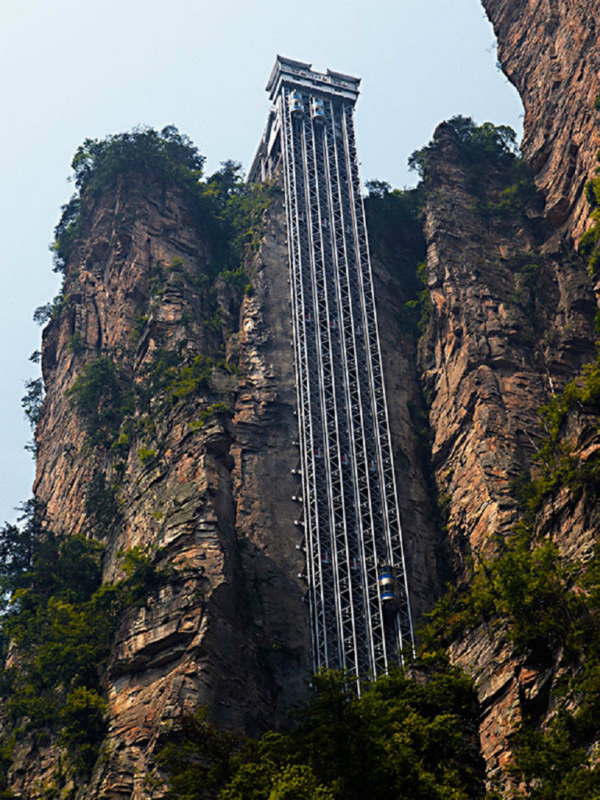 There are many truly amazing elevators around the world and one elevator that consistently makes it into top ten lists is the world's highest outdoor elevator. We are referring to the Bailong Elevator also known as the Hundred Dragons Elevator inside the World Heritage Site at Zhangjiajie National Forest Park in Hunan Province in China. Designed and operated by The Bailong Elevator Company the elevator was built between 1999 and 2002 at a cost of 120m yuan, or around £12m. It was opened to the public in 2002. There are three double-deck glass elevators that vertically transport passengers 330m high (1,070 feet) to a plateau near Shuiraosimen. The first 154 metres run through an underground shaft and the remainder via an above ground derrick. There are earthquake detectors installed so that the lifts can be evacuated quickly in case of disaster. The elevators have a passenger capacity of 50 and take 2 minutes from top to bottom giving a daily capacity of 18,000 people. From the perspective of a passenger the Bailong Elevator is spectacular – the views of the Zhangjiajie National Forest Park are breathtaking and you have a 360 degree panoramic view that stretches for miles. The area is where the movie Avatar was filmed. The elevators save pedestrians three hours of walking. Are you planning a vertical transportation project? Do you have problems you are now facing? Dunbar and Boardman is the lift, escalator and access equipment consultancy. We would be happy to discuss any such requirements and how we may be able to assist. Give us a call on T +44 (0) 20 7739 5093 or send us an email via peterboardman@dunbarboardman.com to start the conversation. We look forward to hearing from you. © 2010 Dunbar & Boardman Partnership Ltd. Powered by Blogger.